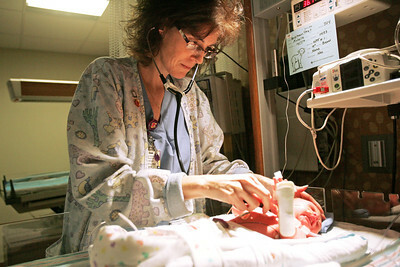 Monica Maschak - mmaschak@shawmedia.com Special Care Nursery Nurse Cindy Lincicum assesses the breath and heart sounds on a six-hour-old baby boy at the Advocate Good Shepherd Hospital in Barrington on Monday, December 17, 2012. 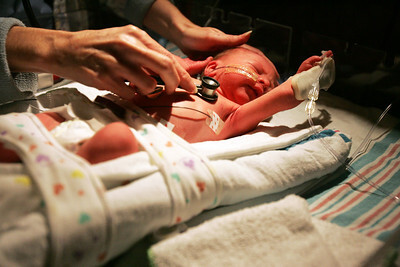 Lincicum has been working with premature babies for 25 years. Monica Maschak - mmaschak@shawmedia.com A newborn baby boy cries while getting checked for breath and heart sounds while crying. The baby, a few hours old, had a heart murmur shortly after birth, but checked out fine after showing signs of distress. Monica Maschak - mmaschak@shawmedia.com Mother Jeannie Roy holds her week and a half old twins Holly (left) and James in the Special Care Nursery at the Advocate Good Shepherd Hospital in Barrington on Monday, December 17, 2012. The twins had just graduated to open cribs that morning, making it one step closer to getting discharged. Mother Jeannie Roy holds her week and a half old twins Holly (left) and James in the Special Care Nursery at the Advocate Good Shepherd Hospital in Barrington on Monday, December 17, 2012. The twins had just graduated to open cribs that morning, making it one step closer to getting discharged.